Reell provides high-quality innovative solutions to transmit torque, control angular position and protect delicate components from excessive force. Combining the world's most precisely controlled torque technology with the industry's most experienced engineering team provides a perfect product fit in customer applications. Reell's patented technology is widely used in the consumer electronics, automotive, aircraft interiors, medical technology, workstation furniture, kiosk/data terminals, and architectural lighting industries. 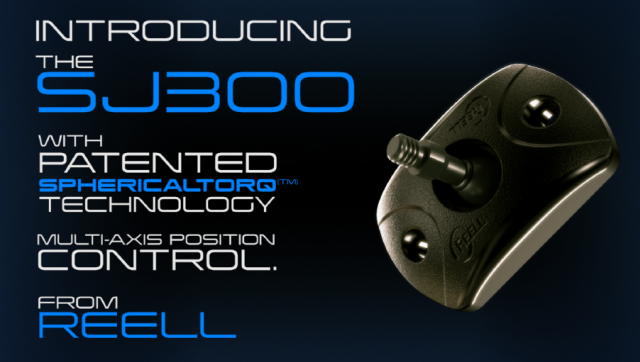 Watch a video highlighting the Reell SJ300 Spherical Joint, the first device to feature Reell's patented multi-axis position control technology. Not sure if a Reell motion control product will work for your application? Let a Reell engineer help you define and refine your needs. With years of design experience creating world-class motion control solutions, our engineers are experts at understanding your application needs and finding the right solution for you. Glass-filled nylon housing designed for press-fit. Designed to be press fit into a variety of materials, Reell’s TI-100 Series of torque inserts feature a molded glass-filled nylon package configuration with 360° of rotation.